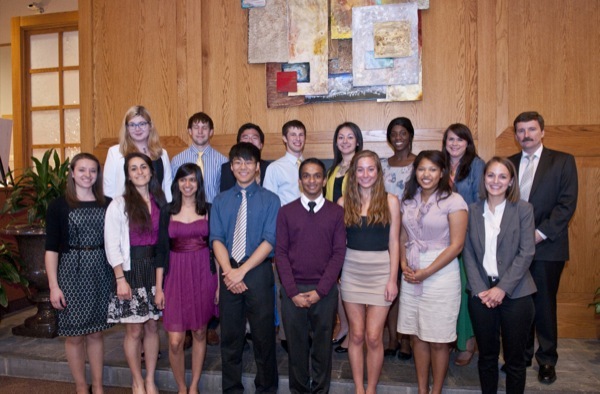 Associate dean Dan Flynn joins the 2013 First Step Program participants at the awards dinner on April 26. 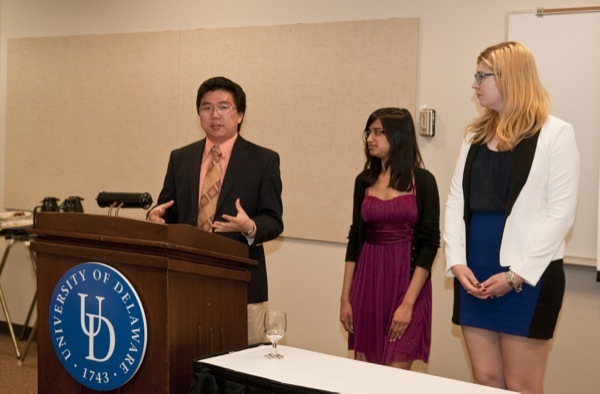 Kevin Chang explains the first place entry “Noms Away” as his partners Mitali Desai and Annie Sanger look on. 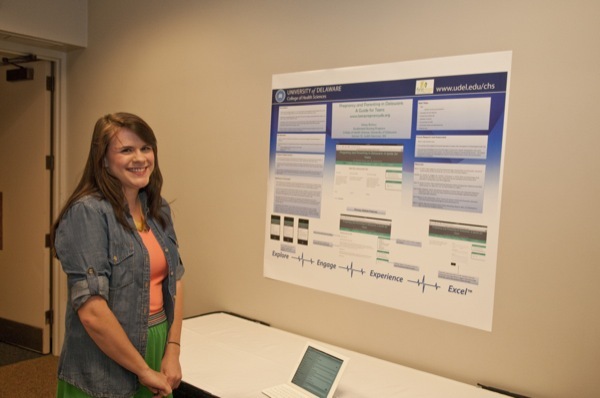 Second place winner Kelsey Bristow developed a website for pregnant teens. Angela Montes talks to Dean Kathy Matt about the project she completed with Michelle Francis, which focuses on improving the delivery of patient-critical lab results to physicians. 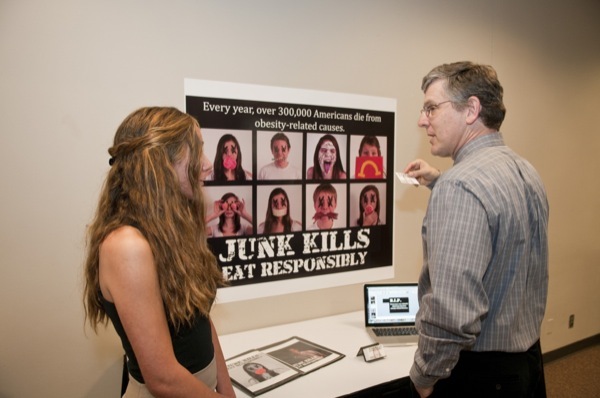 Marta Shakhazizian explains her anti-obesity campaign to Mike Peterson, chair of the Department of Behavioral Health and Nutrition. 9:42 a.m., May 6, 2013--A multifunctional mobile app for use at restaurants, a web portal for teen mothers, and a plan to help the Cheyenne River Sioux eat more healthfully using fresh-grown herbs took top honors in the University of Delaware’s inaugural First Step Program competition. First Step was launched at the beginning of the 2012-13 academic year by the College of Health Sciences to encourage students to identify important health-related challenges and develop novel solutions to those challenges. All of the participants came together with program coordinators, faculty mentors, and family members at an awards dinner on Friday, April 26, in UD’s Clayton Hall. Kevin Chang, Mitali Desai and Annie Sanger laid the foundation for a small business startup with their first place project “Noms Away.” The three seniors created a mobile app that enables users to order and pay for restaurant food while also tracking nutritional content. “We think this is the first product of its kind to integrate all three aspects in a convenient and efficient system,” says Chang. The state of Delaware has expressed interest in sustaining Kelsey Bristow’s “Online Resource Center for Pregnant and Parenting Teens in Delaware,” which captured second place. 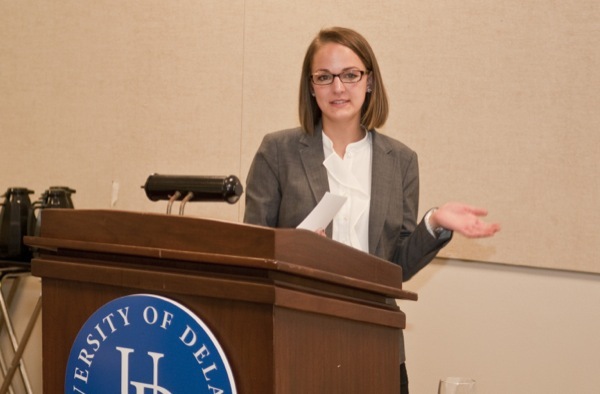 Bristow, a student in UD’s Accelerated Nursing Program, incorporated research on teen Internet use in order to optimize her site’s search results, facilitate navigability, and enable its use on mobile devices. Third prize winner Chelsea Hollowell, a senior majoring in dietetics, will implement the first phase of her project when she visits the Cheyenne River Sioux reservation in Ziebach County, S.D., this summer on a mission trip with her father. Her plan is to improve the health of the residents  who live in the poorest county in the U.S.  by teaching them healthy cooking techniques, produce preservation, and herb garden cultivation. But First Step resulted in much more than the $1,500, $1,000, and $500 prizes awarded to the developers of these projects. Shakhazizian had such a rewarding experience developing the Facebook page and graphic images for her project that she has decided to pursue a career in visual communications and photography. She was also awarded $1,500 by the Clinton Global Initiative to further develop her campaign to end obesity and promote healthy eating. Biology major Jacob Joseph, a senior on a multidisciplinary team addressing food insecurity in Haiti, was also invited to the Clinton Global Initiative. “Malnutrition in Haiti is deeply rooted in a complex web of cultural, social, ecological, economic, and other factors,” he says. “Our goal is to identify ways to combat malnutrition on a large scale.” Other team members were sophomores Allison Morris and Jaewoong Yoo. Michelle Francis and Angelica Montes, both seniors in clinical laboratory science, polled more than 200 physicians’ offices in Delaware to determine how their staff members handle the delivery of critical patient laboratory results. The pair was thrilled with their 31 percent response rate but dismayed to find tremendous inconsistencies both within individual offices and across practices. Their project demonstrates the need for a standard operating procedure for this important function. Stephen Donald, a senior in exercise science, proposed a novel way to combat childhood obesity. His FitTen Program is based on surveying young people about what they think comprises an effective fitness intervention. His goal is to identify 10 core principles for a healthy lifestyle and build a program for 10- to 14-year-olds around these principles. Junior dietetics majors Ariana Haidari and Dana Sivak teamed up to develop age-appropriate solutions to childhood obesity that can be incorporated into school curricula and computer games. “We want the focus to be on nutrition concepts rather on weight control,” Haidari says. Ryan Locke, a sophomore in biomedical engineering, is developing a multitasking device for physical therapy applications. The first phase of his project focuses on the wrist, but his long-term goal is to create specialized devices for every joint in the body. An invention disclosure has been filed on the concept, and Locke hopes that a patent will eventually be issued for the device. First Step was launched at the beginning of the 2012-13 academic year by the College of Health Sciences to encourage individual students and student teams to identify important health-related challenges and develop novel solutions to those challenges. Students were invited to submit proposals focused on an important aspect of health care or healthy living, develop a potential solution to that problem, and present their solution for review. CHS provided $500 to each of the top 10 applications. 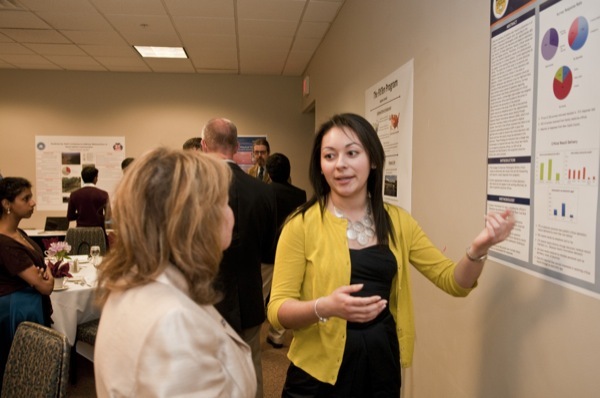 The students had six months to develop their solutions and then present them in the form of posters. They met with program director Dan Flynn and faculty mentors every month and were also connected with experts to discuss the merits of their ideas and how they could be pursued and further developed.